The joint FAO-UNDP Integrating Agriculture in National Adaptation Plans Programme (NAP-Ag) supports partner countries to identify and integrate climate adaptation measures for the agricultural sectors into relevant national planning and budgeting processes. The programme is funded by the German Federal Ministry for the Environment, Nature Conservation and Nuclear Safety (BMUB), through its International Climate Initiative (IKI). Using the Three Horizons Methodology for innovation, joint FAO-UNDP Integrating Agriculture in National Adaptation Plans Programme (NAP-Ag) facilitates dialogues to improve climate governance in Colombia and rethink the way the country integrates agriculture into climate change planning processes. 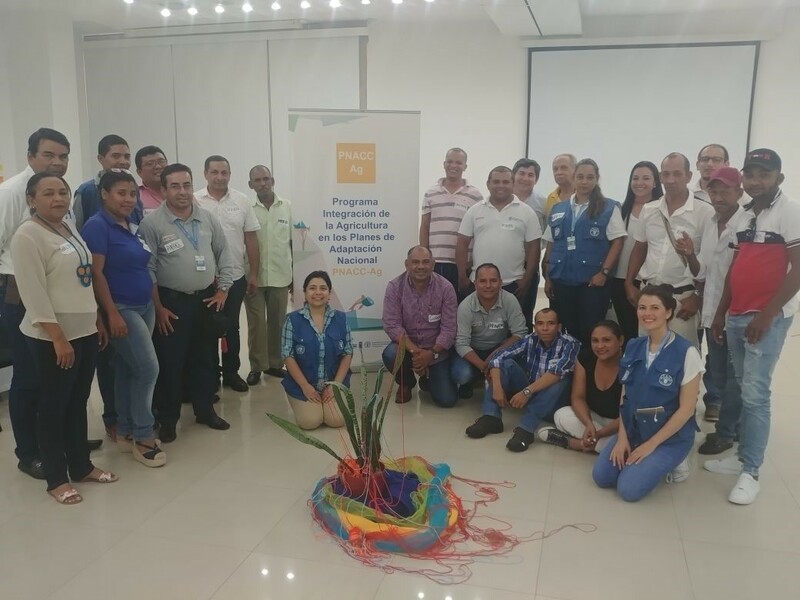 June 26,2018 - During April and May of 2018, the joint FAO-UNDP Integrating Agriculture in National Adaptation Plans Programme (NAP-Ag) facilitated four dialogues in the Colombian cities of Montería (Córdoba), Ibagué (Tolima), Valledupar (Cesar) and Manizales (Caldas). The dialogues are essential steps in updating Colombia's Adaptation Strategy to Climate Change in Agriculture, and have been pivotal in sharing and exchanging ideas and experiences around adaptation to climate change in the agricultural sector in four regions of Colombia. A total of 104 participants took part in the dialogues, among which were representatives of associations of agricultural producers and local fishermen, departmental institutions such as CVS, Cortolima, Corpocesar and Corpocaldas, local government representatives, agricultural guilds such as Fedearroz, Serviarroz, Fedecafé, livestock organizations, research centers such as Corpoica, and representatives academia such as Caldas University. Participants discussed the effects of climate change on farmers’ production and livelihoods, as well as the experiences around the development and appropriation of measures and actions to face the challenges of a changing climate. Furthermore, there were crucial discussions about the barriers and opportunities that producers are experiencing in their daily lives, especially as it applies to strategies to build adaptive capacity. (c) The nature of the tensions and dilemmas between the visions of the future (Horizon 3) and the current reality (Horizon 1). 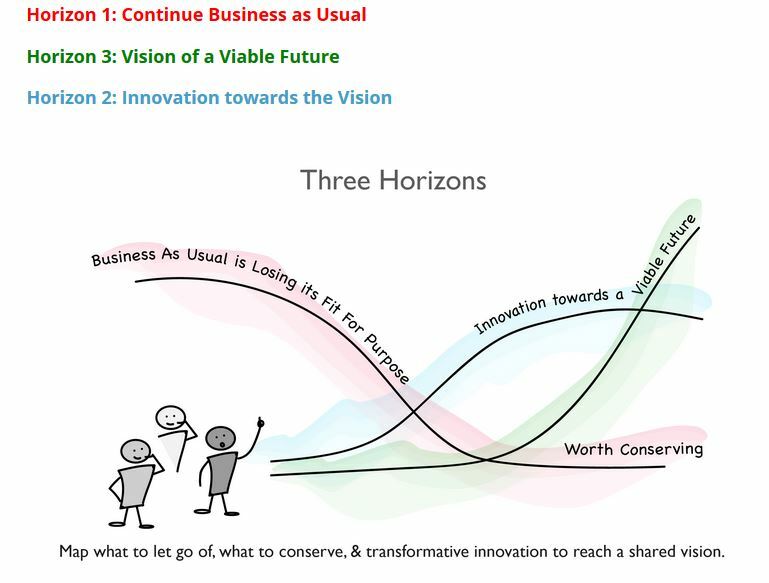 During this moment the participants were capable of recognizing subtle processes of change, innovative forms of work, adaptive strategies that are allowing them to navigate between the current reality and a more sustainable future (Horizon 2). This point was crucial for thought- and co-creation strategies to strengthen the adaptive capacity of producers. Throughout the dialogues, participants acknowledged the economic impacts of extreme climatic events as well as more gradual changes in climate. They also expressed concerns about the material, ecosystemic and cultural losses they are experiencing in their territories. Participants agreed with the urgency of the formulation of the national plan of adaptation for the agricultural sector in Colombia. However, producers expressed caution in regards to the challenges that Colombian institutions have in implementing plans at the local level. They believe one of the significant challenges of Colombia is the institutional capacity to go beyond the idea of “the plan” and take it into real actions to promote and implement real options and strategies to build resilience within the agricultural sector. Likewise, producers called for more local-based information about climate risks and its related economic risks and vulnerabilities. From a more structural perspective, they expressed the urgency of rethinking the forms of agricultural development, education, food distribution, access to land, financial systems and agricultural credits for a more sustainable and equitable future. The participation of the people within these dialogues was valuable and generous, mainly when they shared details on local practices that are strengthening the adaptive capacity of agricultural producers. These dialogues for the NAP-Ag Programme were a great opportunity to open safe spaces to identify essential insights for the design and formulation of the national adaptation plan for the agricultural sector. Also, the methodology of the three horizons allowed the NAP-Ag team to interrelate possible scenarios for the adaptation and transformation of the agricultural sectors in Colombia in the context of climate change.